It made sense at the time; my housemate wanted to be put on my car insurance (boy racer Citroen Saxo. Oh yes. WITH a Babe Squad sticker on the back) so we found the cheapest and signed him up. 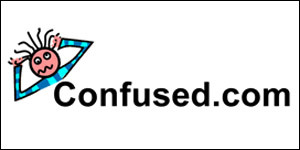 A couple of weeks later I got a random phone call from Confused.com acknowledging that I’d bought car insurance through their site and would myself and 3 other friends be available for a screen test to appear in a Confused.com ad? We’d get paid (a minimal amount) so hell yeah! My first issue was which friends.. Most of my friends would hate being in front of the camera, especially for Confused.com, a lot of them found it hard to get time off work which would be a requirement and some just weren’t… well, that FUN. In the end, I asked Mr Benjamin Marks, Serena Wong and Allan Williams. Ben once dressed up in the middle of Summer as a wartime Santa. He’s fun and would be up for it, even if it was for a Confused.com ad, most definitely. Tick! One down, two more to go. Serena jumped at the chance. She has an awesome smile and likes random things. Plus, although we worked in the same building, we were on different accounts so could both take time off. Al was a little trickier. Although he used to be a dancer (now he’s a Personal Trainer so the thought of him in tights prancing about is something to chuckle about) he didn’t like to do things that reduced his overall aura of ‘coolness’ and a Confused.com advert definitely wasn’t cool. This one had to be tricked. A lovely man turned up with a giant SLR and not much else and for the screen test for the Confused.com ad we just had to smile sweetly and give a short introduction about ourselves. High fives all round, we passed the screen test and were going to be filmed! Confused.com’s agency had shortlisted about 12 different groups of people and would film them all as is it were the real ad, but only use 2 of them. We filmed some idents which involved us all trying to squish onto my mini sofa, eating popcorn, lying upside down, jumping about and generally acting like twats. For the main ads, we played computer games, chilled out and went through Confused.com’s online process and talked about how much we could save. Confused.com were adamant that whatever we were looking to save online we could save a significant amount. So they do use real people and the savings they make are real! Confused.com helped me save money. YAY! After everything was filmed, there was a month or so of cutting and editing until we’d hear whether our Confused.com ad would be shown. It was during Christmas 2009 that the phonecalls from friends and family came in, most rather horrified that they’d seen us in between programmes popping up on their TV sets. Our ad had made it! It also meant we received additional payment.